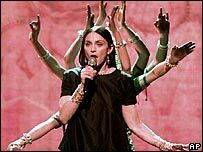 A Belgian songwriter has won a plagiarism case against Madonna over her 1998 hit single Frozen. Salvatore Acquaviva's claim that the song copied one of his recordings was upheld by a Belgian court. His lawyer told the Reuters news agency the judge ordered EMI, Sony and Warner Music to withdraw the song from sale in the country. The companies' lawyer declined to comment while Madonna's UK spokeswoman said she was unable to give a reaction. Mr Acquaviva's lawyer Victor-Vincent Dehin said the judge agreed that Madonna's single used four bars of the song Ma Vie Fout L'camp, which roughly translates as My Life's Getting Nowhere. He said the judge ordered the record companies to get radio and TV stations in the country to stop playing the song. The judge also ordered them to withdraw Ray of Light, the Madonna album on which Frozen appears, from sale, he claimed. Mr Dehin said the companies would face a fine of more than 100,000 euros (£68,000) if they did not obey the ruling within 15 days. He said: "We tried to reach a friendly agreement... but they didn't want to negotiate so I sued for plagiarism. "They have stolen a song, so they have to pay the value of the song." Mr Dehin said he would try to negotiate a compensation deal for an undisclosed sum but was prepared to go back to court if the companies, who have the right to appeal, refused his claim. Madonna's Ray of Light was a critical and commercial success and went on to win her four US Grammies, including best pop album.